Dreary days bring out some of the best clouds during daylight hours. They are very pretty to look at, but are very difficult to photograph. Many times, I have tried and failed to take a picture and have it look the way I saw it with my own eyes. I imagine a day in the future where the dynamic range of a digital sensor will be up to par with the range the human eye can see. I imagine that camera will cost a pretty penny, but it would be a very awesome tool to use. Having said that, we use the tools we have to make the best of what we see. I have witnessed many times photos of trees stretching into the shadowy clouds giving a very ominous view of the world. I haven't really tried anything like this in the past, but with my wife's urging, I ventured out to see what I could capture. Once I was on location, finding the best trees was a difficult task. 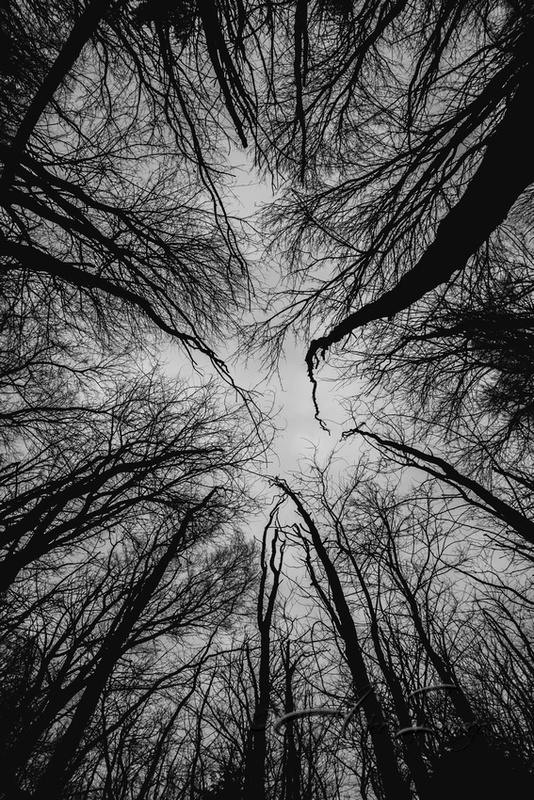 Once I found some strangely fingeresque trees, I placed my camera in position and began snapping away. I tried all types of angles and determined that vertical photos showed what I was seeing the best, but I had to have the camera very close to the ground. So I laid down beside the camera and let the magic happen. I shot a couple with one lens. Then switched over to the fisheye for a little different effect. It provided a unique perspective that I feel has been missing in the photos I have seen. I really enjoyed photographing this scene and will definitely have to go back to see what other interesting things I can find.